"What a man needs in gardening is a cast-iron back, with a hinge in it." Haven't seen many Monarchs lately in the container garden, or other species of butterflies for that matter. 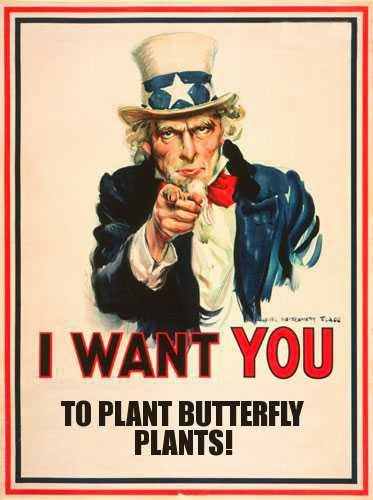 One or two Monarch butterflies, one Gulf Fritillary flitting about the passion fruit vine, and just yesterday, a Western Swallowtail came to visit one of the Verbena bonariensis currently blooming. The good news is, the garden is home to various growth stages of Monarch caterpillars. Strolling through the garden yesterday revealed at least three wee small Monarch cats in and amongst several of the milkweed plants, along with a couple of others of different sizes. Statice, also known as Sea Lavender, is a great perennial nectar flower candidate for mild climate area butterfly gardens. It's easy to grow, drought tolerant, has showy bluish flowers, and offers its butterfly sweetness during the winter and very early spring when nothing much else is available in our sleepy gardens. There are butterflies that overwinter here in Southern California, while others are passing through. You'll see them in the dead of winter searching for precious nectar within the florets of statice. During the active butterfly season, one will see just about every type of local butterfly visit its flowers at one time or another. The crepe paper textured inflorescence makes for long lasting dry flower arrangements for inside the house, or on a patio table outdoors. Limonium sinuatum is another garden species that is fairly common in nurseries. Differences between L. sinuatum and L. perezii are that L. sinuatum is an annual, comes in several attractive colors, and requires a bit more water than its cousin in order to look good. L. perezii is perennial, comes in pretty much one color, and is tough as nails drought tolerant. I have no idea at how attractive L. sinuatum is to butterflies, having no experience with it. If shopping for statice in the nursery, no need to buy one gallon plants; buy the smaller quart, or 4 inch containers instead. Sea Lavender is a fast grower, and planting them the smaller they are, the better they root. I've seen them offered in color paks, six to a pak, too. Transplanting statice is easily done if you already have some volunteers coming up, or a gardening friend offers you some. The trick is, dig them up for transplanting when they are fairly small, as statice seedlings tend to put down a deep taproot looking for water. The smaller the plant, the shallower the root system, hence easier to dig up, and consequently, better survival rates. Nothing much bothers this plant, with no known diseases or pests that threaten them. I've seen thrips attack them at times, but incidences are very rare and of short duration. Too much water is the usual culprit, as it makes the leaves very soft and juicy; just what thrips love. Likes sun, but will do admirably in shade with bright light. You can pretty much forget about statice once established, as it will fend for itself just fine without our intervention, especially along the coast. For those that are very water conscious, a good once per month soaking would suit these plants just fine. A little bit of fertilizer two or three times per year is all it really requires to look and bloom its best. 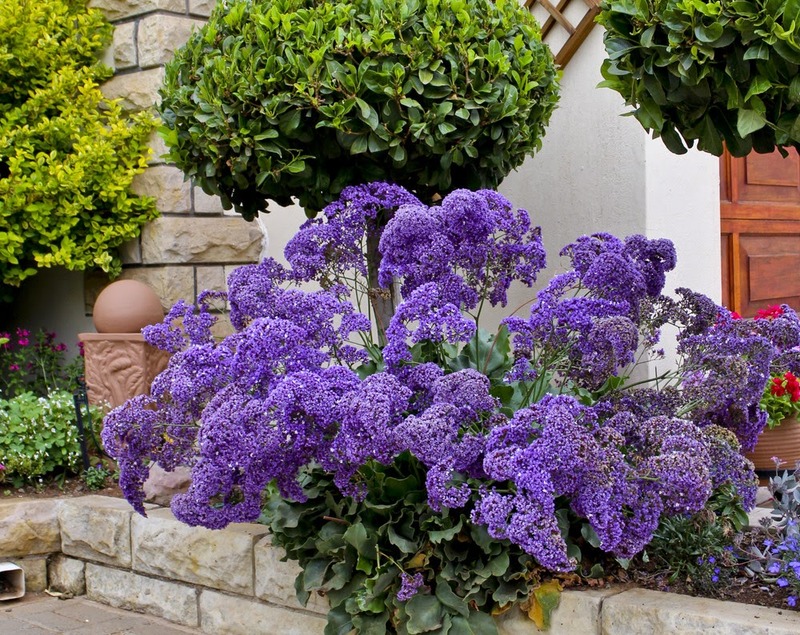 Statice makes for an excellent container plant, and fits right into xeric landscapes. 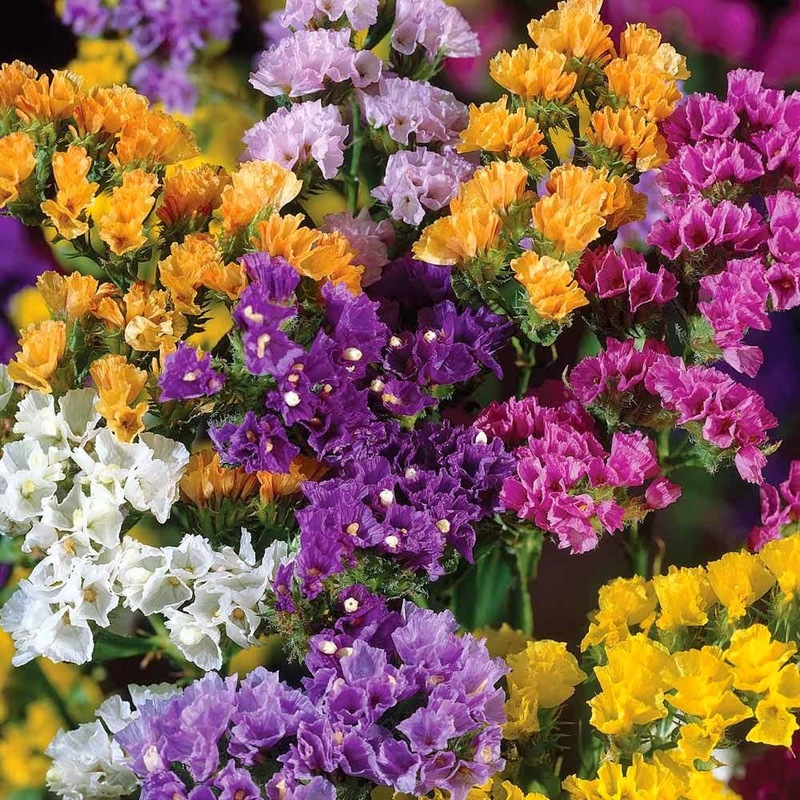 If you wish to expand your statice plant population or create a collection of them, let the flowers completely dry and fade, allowing them to fall around their mother plant. One can also easily pull off these seed laden spent blooms, sprinkle them around an area one wishes to introduce them, and then watch as little seedlings eventually pop up. To encourage germination and to keep the seeds from blowing out of a designated area, first scratch up the soil a little bit, sprinkle the little flowers around, scuff them into the loosened soil, and then water in. A light blanket of mulch on top will help hold everything in place, conserves moisture, and acts as a seed marker too. With today's dire drought condition here on the West coast, L. perezii is one candidate that should be examined more closely for incorporation into a water wise garden.